I have used korda hooks for some time now, I really do like the curved hook pattern that they do especially with flexible fluorocarbon and have used it a lot as they appear to be readily available in the barb less pattern which on occasion my preferred hooks ( Fox SR’s) are not. One of my biggest gripes with Korda hooks is that they are provided loose in a packet and over time they will rub together and some of them will loose their sharpness. This was fine in the old days when hooks were a pould a pack ( remember those days ?) well now at 5 pounds a pack I do expect each and every hook to be perfect. 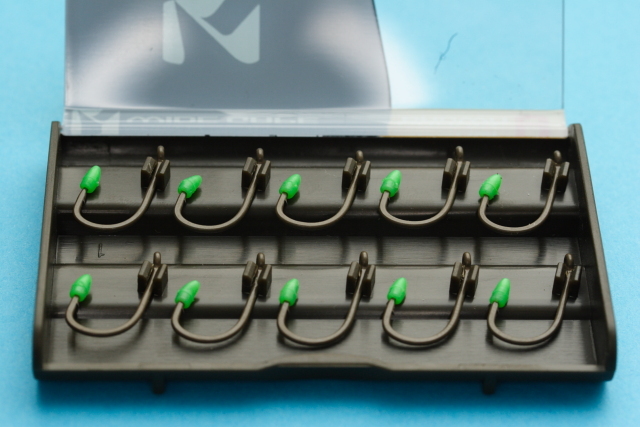 Fox solved this early on with their nifty little boxes which although the hooks are not individually packed have a foam insert to stop the hooks from rubbing together during transit and when in your tackle box. Korda have taken the approach to individually mount the hooks which has the effect of making them more visually appealing. 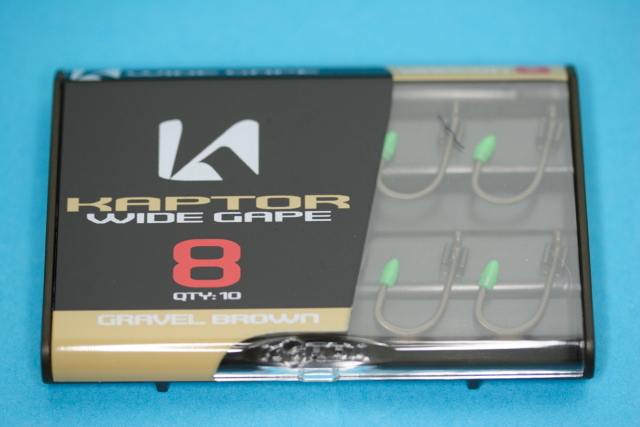 Korda have not changed the design of the hooks, the kaptor hooks are the same the the original designs but they have been coated with either a weedy green or a gravel brown effect. 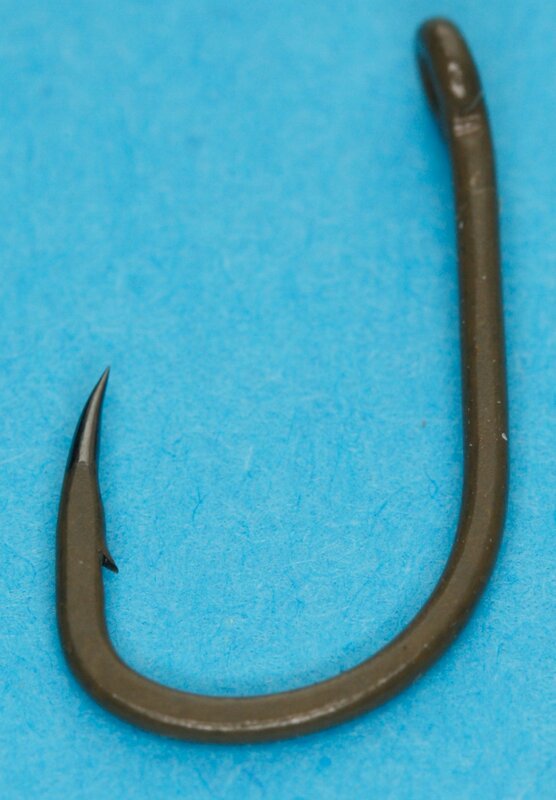 Please understand I think that the colouring of hooks is something that is designed to capture the angler rather than the carp ! as long as the hook doesn’t stand out bu being shiny I have no problem. The Fox standard dull grey has been good enough for me for ages and if I come to think about it I have caught carp on ridiculously shiny hooks in the past so to me the coating is largely cosmetic. No doubt there will be a whole load of “named” anglers telling us that they caught more fish just because they matched the hook colour to the lake bed 🙂 oh well. Youngsters – dont be fooled. Opening the packet you can see all of the hooks individually laid out like toy soldiers in the box and have to say Korda have gotten the visual appeal just right they look the business with their individual little caps on each hook point. Note to marketing people…. I know that korda’s schtick is to use the letter K everywhere… but the word cap is spelt with a C, please don’t just randomly start words that begin with a C with a K just for the sake of marketing, our nations youth are illiterate enough without some of them now believing that the word cap is spelt kap. As you can see from the above the coating has been removed by the chemical sharpening process leaving the bare metal exposed which in theory should give you maximum sharpness. 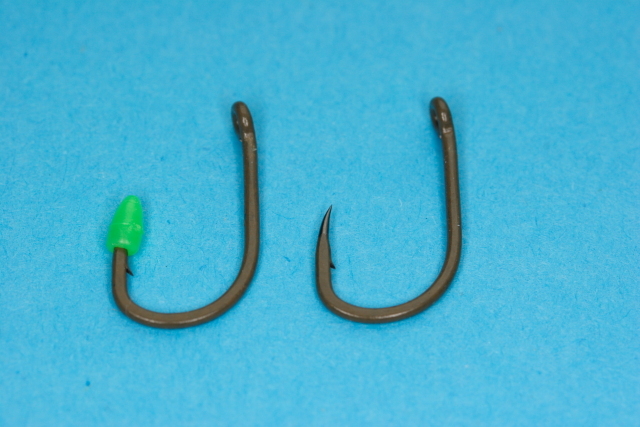 In clonclusion, whilst i need to get out there and try these hooks they certainly look the business. They are well packaged and I am sure that they will be a great success. By marketing them to the angler who loves to camouflage everything they have instantly sold 3 times the amount of hooks as each angler will need 3 packs of each size in each of the available colours ( or am I just being cynical ? ) but apart from that they look to be a slight improvement on what is currently out there… but do you need that improvement ? 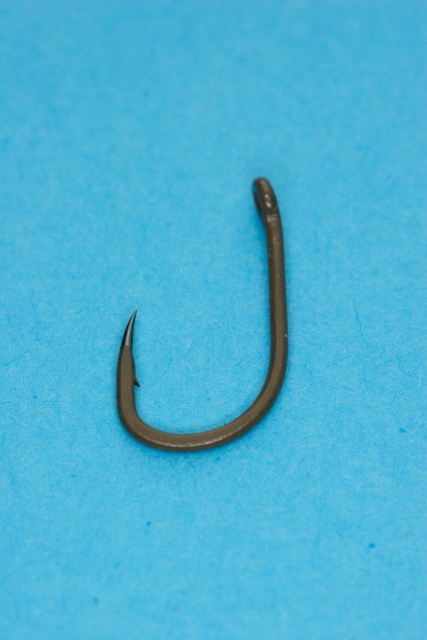 These hooks are rubbish, in fact the whole Korda company is rubbish. Iv had these hooks bend and snap on me I complained and they havnt even given me a reply. As for the rest of there products, well a contraption to cut boilies in half for £15 what a joke. BUT the biggest fraud is that they big up lakes like Oxford linear and pretend that there team can catch fish anywhere using there products but the simple truth is that they make sure that lake hasn’t been fished for weeks then jump on . Having visited the lake I know not to go back again as I don’t like fishng next to twenty other anglers Korda shame on you what crap product will you fool people into buying next. Hi, I wouldnt go as far as to say that they are rubbbish. Certainly I have never had the issues you describe but remember you dont have to buy each and every gadget that comes out in fishing. Some are there to catch more anglers than fish. Next Next post: Competition time – Win a Spomb !